I use Factset rather than the Bloomberg data used by the Wall Street Journal, and so maybe there is a timing issue. 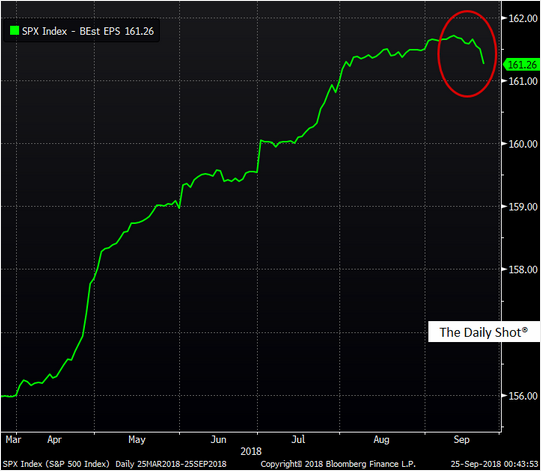 Also, it is worth noting the fall in earnings in the Bloomberg data is about 0.5% – pretty much a rounding error that could easily just be the mark to market effect of the rise in the USD over the last few months. And these calculations aren’t simple, stocks dropping in and out of sample plus incorrect analyst data can easily make a change the size that Bloomberg is showing. Investment markets are late in the economic cycle, the issue being that you never know when the end will come. However, there are some signs that it is not here yet for US equities at least – and there is the potential that US equities will hold the rest of the world out of the abyss for a little while longer. The main factor that gives me comfort with the US market is the strong earnings growth that continues to define the US market. In general, when forecasts earnings are rising strongly markets don’t have 20%+ corrections. And I still believe that to be true – if there is going to be a major pullback it is unlikely to occur in a time of rapidly rising forecasts, and so when earnings do start to decline we will need to be more wary of stocks. 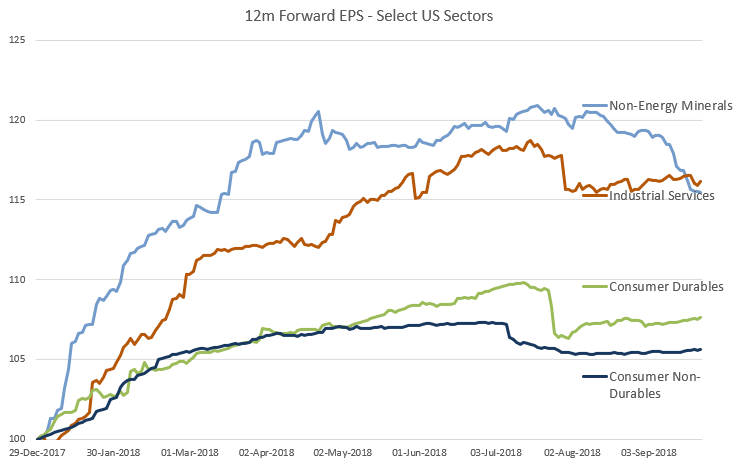 The US is going to start reporting 3Q earnings in about a month, and so if earnings downgrades are going to occur we would expect to see them over the next few weeks. The net effect? Alert but not yet alarmed. 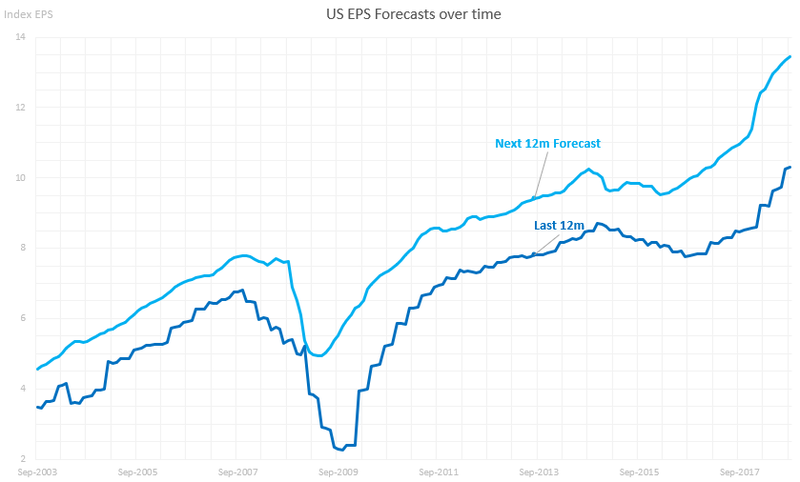 It is worth watching earnings forecasts more closely over the next few weeks, but I can’t yet see meaningful downgrades to US profits. 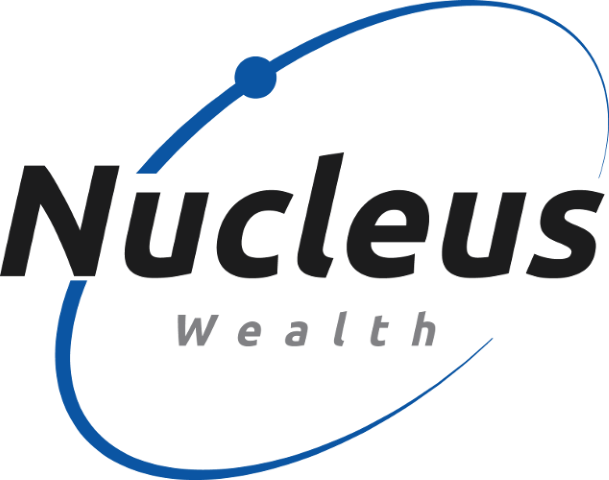 Nucleus Investment Insights – Australian Dollar Reflation?